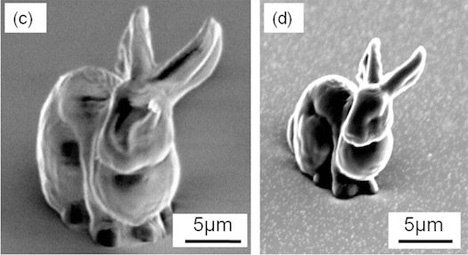 The bunnies you see above aren’t just cute sculptures created by bored scientists – they could be the future of microscopic implantable bionic devices. The implantable devices could be used to create microelectrodes that can treat conditions like depression, Parkinson’s disease and epilepsy. The rabbits, and the coils below, are highly conducive, the size of bacteria, and can be implanted in the brain to send and receive electrical signals. Before creating these intricate shapes, the team of Japanese scientists had to create a new type of material. Previously, the resin they used melted into shapeless blobs when baked at high temperatures, a step that is necessary to make the resin more conducive. They finally settled on hardening the material with laser beams, building the 3D shapes layer by layer on liquid resin. The resulting shapes experienced very little distortion, making them viable as the next generation of implantable microelectrodes that could make millions of patients’ lives better.